Located just 20 km's from Kerikeri, Northland. This beach house has spectacular views overlooking Takou Bay and The Cavalli Islands. Home to world renowned attractions including the Rainbow Warrior Ship Wreck and the Kauri Cliffs golf course. 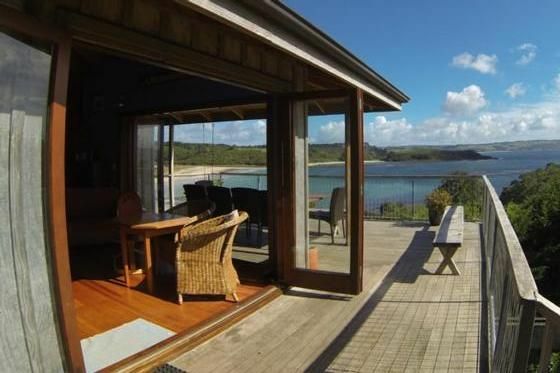 Situated centrally in Northland, Tapuaetahi Beach is an ideal place to base yourself if you intend to explore neighbouring Bay of Islands and the Far North. However you may find it hard to drag yourself away from this special piece of paradise. The house is in a kiwi zone, and has a number of kiwi birds resident in the bush at the back of the house. House can be rented separately from the Studio Flat, please enquire. Just a minutes walk to a pristine white sand beach, ocean, estuary and lagoon, safe swimming for the whole family. Set back on a hilltop with outstanding views of the Pacific Ocean, Takou Bay and the Cavalli Islands. Outdoor steps to reach both main house and studio flat. Great Bach with incredible views. Great Bach with incredible views. Location fantastic. We loved our stay. This property was fantastic for our large family group. we loved the beach and the view. we loved the beach and the view. Only thing is that no shops around, make sure you take everything you need or shop in Keikeri. All amenities including groceries, ATM, Medical Services are 15-20 kms away in local Waipapa or Kerikeri.